I had the incredible experience of being a TEDx speaker with my dear friend Margaret Combs. 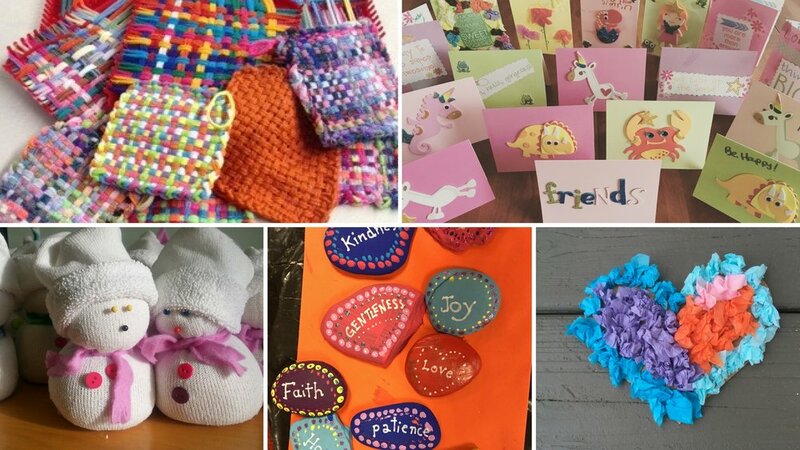 We had the opportunity to share our story about empowering children to make a difference by teaching them the importance of giving to others through crafting. I am excited to share our script and amazing experience as TEDx speakers. This is the story about a little girl named Rachel. For Rachel’s 9th birthday, she wanted to do something different. Instead of receiving gifts, she wanted to raise $300 for Charity Water, a non-profit organization bringing clean and safe drinking water to people in developing countries. One month later, Rachel passed away in a tragic accident. The pastor at her church continued her fundraising campaign for Charity Water and as word spread about her generosity and compassion for helping others, donations came pouring in. At the end of Rachel’s Charity Water campaign, she raised $1.2 million dollars. Because of her wish, 143 water projects were built providing 37,700 people with clean water. Her story inspired almost 32,000 people from all over the world to donate to her cause. This story shows the powerful impact one child’s action can make on the world. It is also a great example of how a young child can look beyond his or herself. How can we facilitate and inspire more of this kind of action within children? We believe that all people are born inherently good. We have experienced the capacity within children for kindness, compassion and empathy. As adults who engage with children - as parents, teachers, relatives, neighbors or friends - we have the obligation to nurture this goodness and to teach children that they have power to make a positive impact in the world. Even better, we can help children make the transition – naturally - from a tendency to think of themselves first to empathetic and active contributors in society. By providing repeated and intentional giving experiences, where children begin to own their transition. In the words of Maria Montessori, “the child is constructing the person they will become”. With this in mind, as a Montessorian and a social entrepreneur that built a website connecting crafters with organizations needing handmade item, we wanted to combine our passions for working and children and helping others. We wanted to explore the idea of involving children in creating a charitable project to show them first-hand their personal ability to help others. Charitable projects can come in all different forms, from raising money to service projects. And service projects can vary - from volunteering in a homeless shelter to collecting cans at school for a food drive. 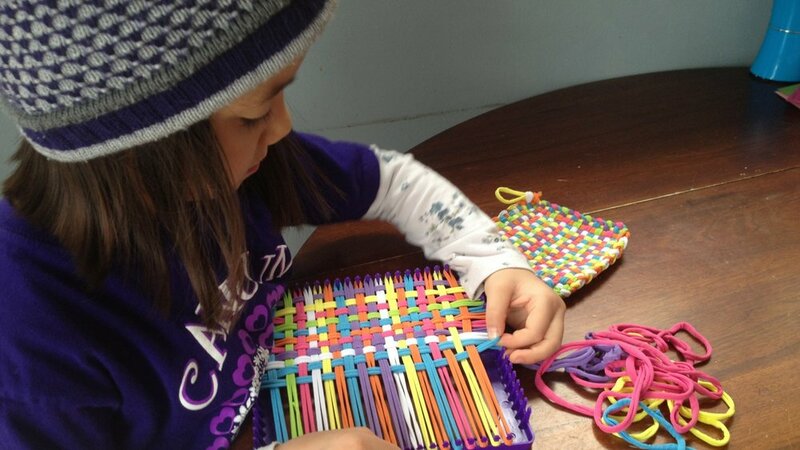 We chose to focus on projects where children use their own hands to create items to donate. 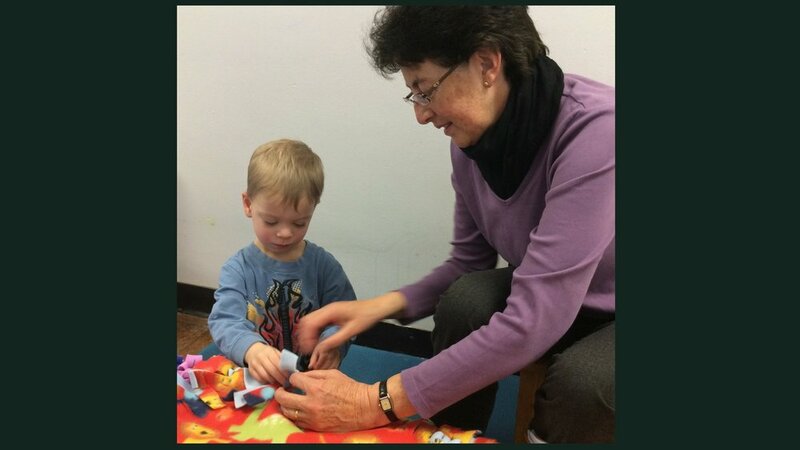 At this age, children understand the value of their own time and effort much more than the concept of monetary value. We wanted to begin by sharing real stories related to the social issue for which we were going to be crafting for to allow children to develop empathy and a stronger connection to the project. Through these stories, the children would begin to understand the positive impact their actions could have on others. 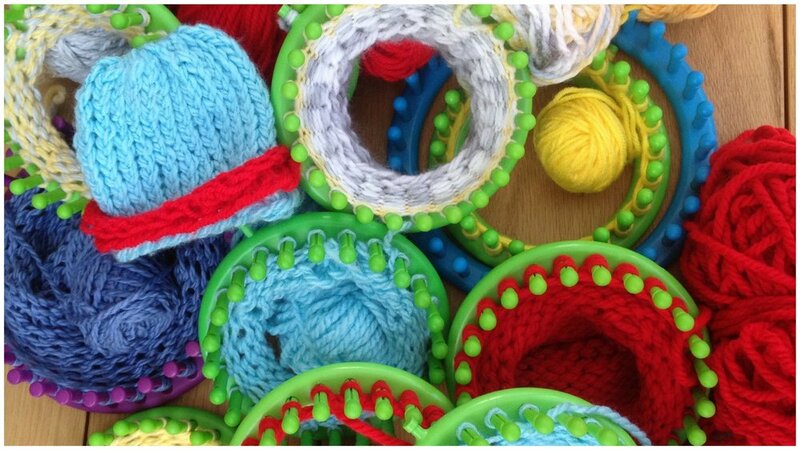 The first project we took on with the children was to knit hats for babies born premature and therefore at risk. The donation of handmade hats was a means of sharing hope and love to the preemies and their families. Here and with subsequent projects, we consider the age of the children were are working with to guide how we approach sensitive topics. As the children worked, we saw an amazing change within them. The children began supporting and encouraging each other’s work. As they got closer to the finished product, the discussion between the children was inspiring – “I can’t wait for a preemie to wear this hat!”, “Can we make another one when we finish!”. 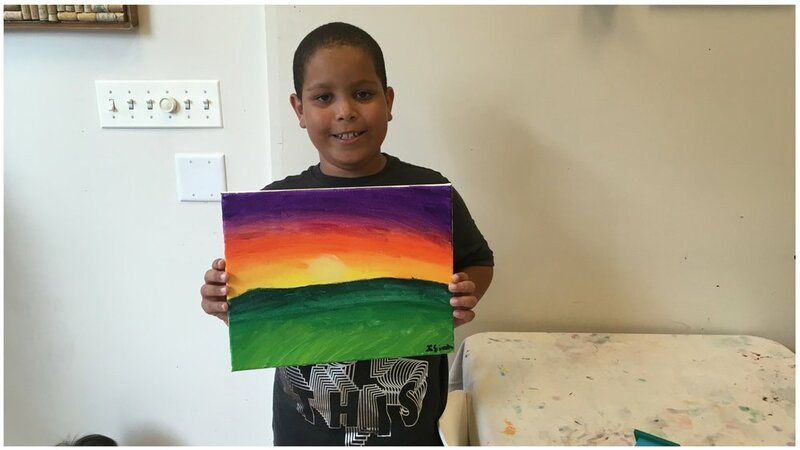 Their excitement grew as they finished the project and then came the realization that their own hands, their time, their effort just made something special that would help somebody else. But we didn’t just stop at one project. We started exploring different groups we could help, like the homeless, elderly or children at hospitals. As we brought more projects to the children on a regular basis, their engagement grew. The children began to feel a sense of ownership, empowerment and selflessness. Conversations became more meaningful and the children stopped asking if they would get to keep the project for themselves. They now realized that each one of them had the capacity and power to make a difference. Our approach to service learning is to engage the children’s time, energy and skills to craft items to give to others. We have seen first-hand how parents and schools are embracing the concepts of service based learning through crafting. My program that started with just 12 students has grown to include hundreds of children across the country participating in the making of thousands of items to be given to others globally. In support of this, an analysis of 62 studies involving almost 12,000 students indicated that, compared to controls, students participating in Service Learning programs demonstrated significant gains in five outcome areas: attitudes toward self, attitudes toward school and learning, civic engagement, social skills, and academic performance. As parents, we can testify to the fact that these can be some of the most difficult things to impart in our kids – their self-view, world-view and attitude towards learning. However, through our work with children, we have seen children of all ages benefitting from our approach of service-learning projects through crafting. We started this talk with a heroic story about one child’s impact on a larger cause. However, we want to stress that helping just one other person can make a difference and cause a ripple effect. Just a month ago, a video went viral of a little girl, at a restaurant, walking outside with her dinner plate to give to a homeless man. The difference she made for that man on that day not only impacted him but also touched hundreds of thousands of people. With homelessness in mind, another project we chose was to have children make blessing bags for the homeless. Homelessness is an issue many children see first hand in their communities, that evoke many questions. We talked about needs versus wants and to give some context on the issue. Children filled bags with basic necessities, such as soaps, shampoos, and granola bars. We then asked each child and their parents to disperse the bags when they saw the homeless in their communities. Tackling such a complicated issue with children is challenging. However, we knew this project hit the mark when we received the following response and picture. 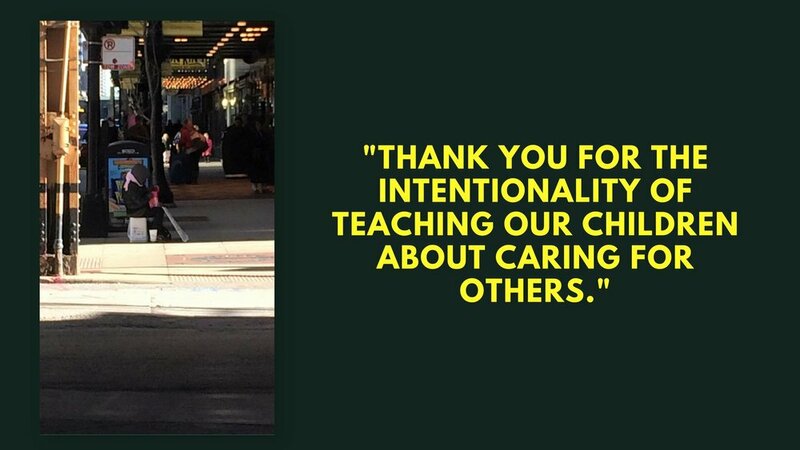 “Thank you so much for the intentionality of teaching our children about caring for others. [My girls] were thrilled to handout their blessing bags while we were downtown today. We even kept our distance and watched as the woman poured over her bag excitedly”. We love this story because it shows the full cycle of giving. It not only showed the children’s excitement in helping someone, but also allowed the children to directly experience the appreciation of the recipient. We have witnessed first hand the transformation that is created within a child from thinking mostly of his or herself to consciously thinking of others. We have an incredible opportunity to shift our culture and to invest in the potential generosity of our children. Will you join us and go home today to begin this journey. It is as simple as making blessing bags for the homeless, cards for children in a local hospital, or gifts for residents of your local senior center. The possibilities are endless. And as each child makes an individual change, a collective change occurs within society. We know we can create a kinder, more compassionate and empathetic society, one child at a time.